The Work of Finding Work | American University Washington D.C.
Advisors in AU's Career Center say students finishing their AU degree have reasons to be optimistic about the job search. Remember that cheerful Dr. Seuss book Oh, the Places You’ll Go! that relatives gave as a graduation gift? For many graduating students, entering the 21st century job market feels more like frighteningly staring into the abyss. The job search can be an exasperating process, and even the most qualified applicants experience frequent rejection. Yet, as advisors in the American University Career Center can attest, students finishing their AU degree have reasons to be optimistic. In addition, just knowing what to expect about the job search can help make this experience a little easier. To get a clearer picture of the job hunt, University Communications talked with two Career Center staffers: Brian Rowe, director of experiential education, and Nathan Slusher, director of outreach and marketing. Rowe and Slusher stress that you won’t find a job overnight. Rowe says it usually takes non-business majors about three to six months to find an entry-level job. If you’re looking for a position that requires a government security clearance, it could take up to 10 months. “They’re going to send out a lot of applications, and they’re not going to hear back at all from a lot of those places. They might get an auto-generated confirmation email,” says Rowe. Rowe also explains how job searching is fundamentally different from what students have previously experienced. 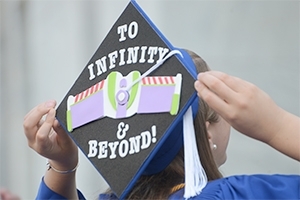 For many AU seniors, each step in their education has been linear. Now, it’s somewhat random and unpredictable. “Ever since students were in kindergarten, they’ve known what they were doing the next year. They’re given a syllabus that reads, ‘Here’s how you’re successful in this class,’” he says. “When they come to graduation, it’s sort of like a train track and the track runs out,” Rowe says. By contrast, he adds, post-graduation is more like sailing a ship, battling the elements of wind, water, and stormy weather. One way to decrease the number of employment rejections is by increasing your network base. Again, this requires patience. “Some people are extroverts who thrive on going into a large room and shaking hands,” says Slusher. But other people find large networking events intimidating, and Slusher advises them to start small and manage expectations. “You go in there, and you come out with one or two people you’ve talked to, and you’ve got business cards, and you’ve had a real conversation. That’s a successful night, even though there’s a hundred other people in the room,” he says. This may seem daunting, but some students don’t even realize the networks already within their grasp. “Human beings are natural networkers,” says Rowe. You have family, friends and classmates, as well as acquaintances from civic organizations and churches. “Everybody knows how to do it, but then sometimes you need to focus your network and build it in a certain area when it comes to a career,” he notes. Yes, there is great news to report: AU students have a strong track record in finding employment and bolstering their career prospects. The We KNOW Success website finds that, six months after graduation, 91 percent of all recent undergrads are working, attending graduate school, or doing both. Based on Grad Census data that feeds the We KNOW Success site, Career Center officials will proactively offer assistance to recent AU grads still seeking employment. And current AU students have plenty of job-seeking resources at their disposal. The Career Center sponsors four networking receptions throughout the year, connecting alumni and employers with students from the School of Education at CAS, School of Communication, School of International Service, and School of Public Affairs. Kogod School of Business and the Washington College of Law have their own career offices. The Career Center also runs an Employer-in-Residence (EiR) program, bringing in one or two employees of an organization to meet with individual students for 20-minute appointments. Since these meetings are not directly associated with a particular job or internship, it takes the pressure off students and allows them to get unfiltered career advice. Based on survey results from the National Association of Colleges and Employers and the Association of American Colleges and Universities, the Career Center emphasizes the top six skills that employers are seeking. They communicate this to students, who then have a firmer grasp of what’s needed in today’s job market. The six skills are written communication; oral communication; collaboration and teamwork; quantitative and applied technology; critical thinking and analytical reasoning; and decision-making and ethical judgment. “It’s a surprisingly simple, but very effective way to get everybody on the same page. Employers are looking for these skills. You have these skills. Not only are you honing them through all of those activities, but you’re honing them in your classes as well, through research experience and group work,” says Slusher. The center offers plenty of do’s and don’ts about securing employment. But one thing should seem quite familiar to students who’ve spent the past four years in college: Do your homework! Read up on your prospective employer, and tailor your cover letter to that organization’s needs. Even following that employer on Twitter can make a difference.